You may select from predefined templates or create your own certificate to issue this certificate once the course is successfully completed by the student. The certificate may be downloaded by the user as the pdf file or may be sent via the notification email. Enter the Certificates list and editor through Administration / Course or Administration / Lesson module, Certificate tab. 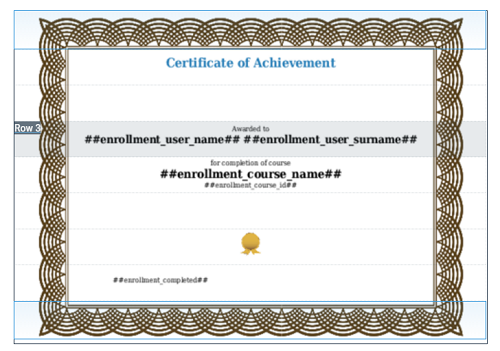 There is unlimited number of entries allowed and you may create unique certificate for each course and personalize it to every single user. * Background Editing tab starting with general data and the background settings. You may leave empty (white), image - predefined images, or custom image that will be fit into the background. * Line tabs - each certificate is split to 7 horizontal zones where you may add your texts or system variables to personalize the certificate for each user. * Lines 1 - 7 you may set number of columns that will be splitting the line. You may also use the Column settings to set empty (white), add text via editor, add image - predefined image, or add custom image. * Preview of your certificate shows your changes and final certificate view. All changes are shown when you press Preview. You may also select the lines and the appropriate tab will be displayed to allow you edit it. Each new certificate creates with the predefined text and system variables to give you inspiration and help you create it much easier. The certificate must be assigned to the Course that will be representing. One certificate may be assigned to more courses. Go to the Administration / Courses / select the course you want to assign. Select Edit course entry, the form includes Certificate list. Select the certificate item and save the Course entry. Now is the certificate assigned. Edited 2 time(s). Last edit at 04/16/2017 08:49PM by admin_admin.